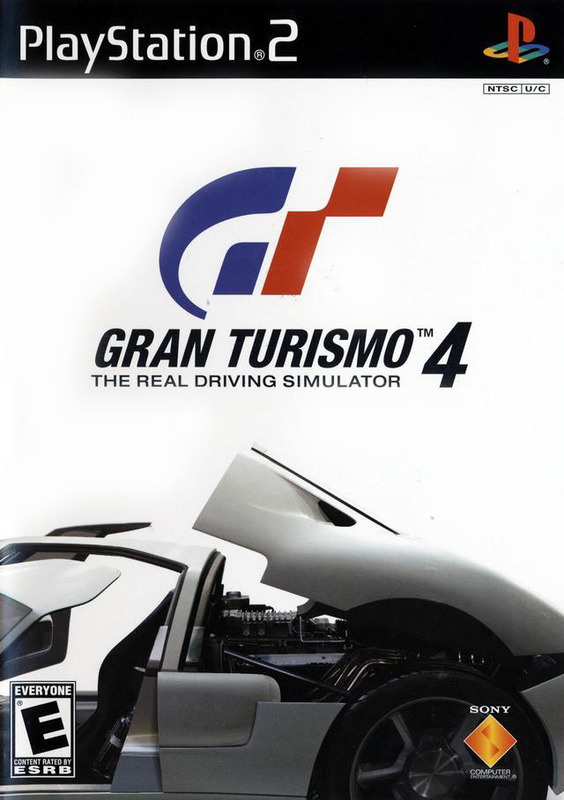 Gran Turismo 4 features authentic racing gameplay with new fully-enhanced features that focus on more cars, courses, race modes.In gameplay, players will have the opportunity to race in an enhanced arcade and simulation mode based upon similar game mechanics from Gran Turismo 3 A-spec. In both modes, players will have access to experience more than 500 authentic automobiles encompassing manufacturers from around the world, with a range from vintage to modern vehicles. Courses include existing closed racing circuits to specially designed city courses, reaching a total count of up to 100 tracks. To further enhance the realism of the driving experience, new technology blends real-time action with a photo-fixed background to immerse the player in real-life environments such as New York City, the Grand Canyon and others. Highly detailed vehicles and environment mapping create broadcast-quality graphics, from light and competitor car reflections on the player's automobile to leaves on a tree shaking in the wind. 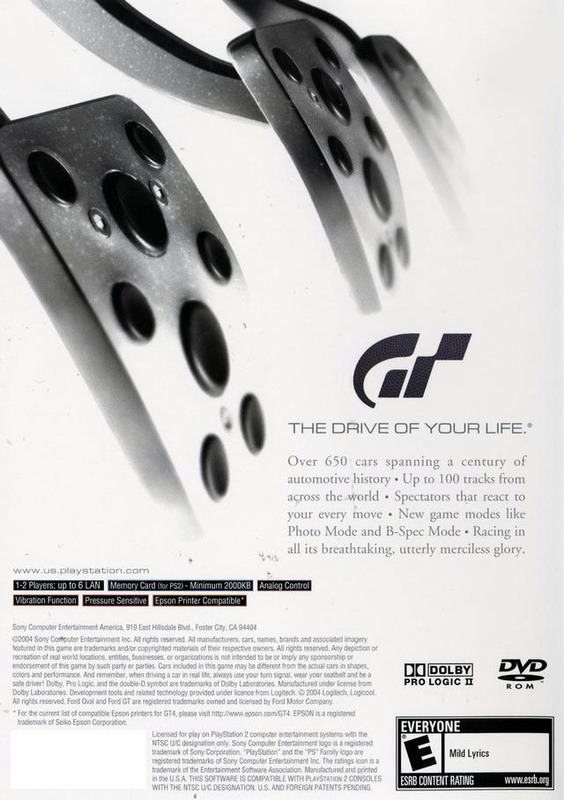 If you're into racing games, Gran Turismo is the top of the pops regardless of what edition you get. I believe this one was the best selling game on the PS2. What more do you need to know? As with everything ordered from Lukies...very satisfied customer. Very good game product, I have spent many of hours collecting some of over the 750 cars there are, I believe. So far I have over 350,with as many upgrades and tuning options, I mean hours(days),playing. I'm totally addicted. EXCELLENT TIME SPENT! !! My 7 year old LOVES to play this game! He loves cars and choosing his own cars is right up his alley. He loves racing against the other cars. Certainly the best racing game ever made on the PS2 platform. Challenging to say the least. Can litterly spend hours mastering each phase. A must in any collection. 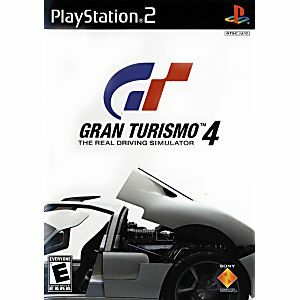 Excellent game, in my opinion Gran turismo is the best racing series ever made, and GT4 is an outstanding example of what other racing games should be like. I have been playing this game for years, and it never seems to get old! If you are into arcade style race games this may not be the game for you. GT4 is more of a racing simulator than a need for speed style arcade game. But it gives you a chance to test drive some of the most exotic cars ever produced, with almost endless car customizing and tuning. The game does take quite a bit of skill to get good at it, but I would also consider this a good aid for teaching children the basic theory of actually driving. So if you don't own this game buy it! Great game challenges you abilities. This is one that my collection was missing it was cutting edge and still takes skill to excel at it. It's a blast to play. Highly recommend it.